The activists maintain that the Zumwalt is a provocative escalation of the already out-of-control arms race aimed at China and Russia. 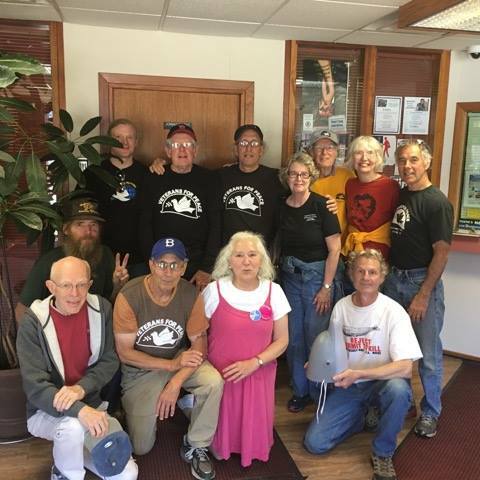 “It is time for us to stand up and call for the reversal of this endless and illegal war cycle that our country is engaged in,” the peace activists maintained in a statement released to the media. “It is the children that these weapons are ultimately aimed at as we see the growing refugee crisis from countries where the U.S. has been waging war. 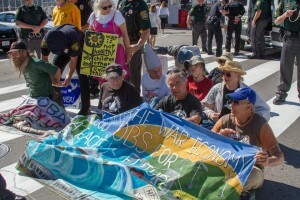 “We stand in solidarity with people around the world who are protesting at bases where the U.S. will port these warships. Not only would these destroyers kill innocent people but their sonar also severely impacts ocean life and the toxic materials released by these ships pollute the seas and the local environments where they are ported. A University of Massassachusetts-Amherst Economics Department study reveals that military spending is actually the worst way to create jobs. At the very time we face the coming ravages of climate change our tax dollars should be spent on building commuter rail systems, offshore wind turbines, tidal power systems, and solar power – all of which would create more jobs at BIW. More information is here at Bruce Gagnon’s Organizing Notes blog. 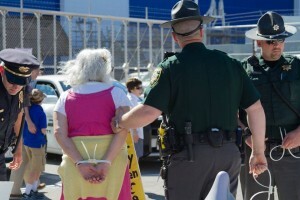 posted June 18, 2016, at 1:34 p.m.
BATH, Maine — A group of 12 protesters, several of them members of the organization Veterans for Peace, were arrested Saturday morning outside Bath Iron Works as thousands gathered in the shipyard for the christening of the future USS Michael Monsoor. 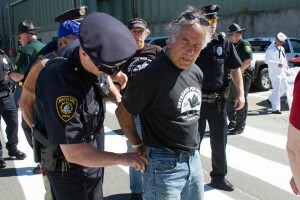 The protesters blocked traffic on Washington Street, outside the shipyard’s south gate near the intersection of Spring Street, shortly before 9:30 a.m., while people stood in line to enter the event and the future crew of the destroyer marched into the yard, according to protester Bruce Gagnon of Bath. 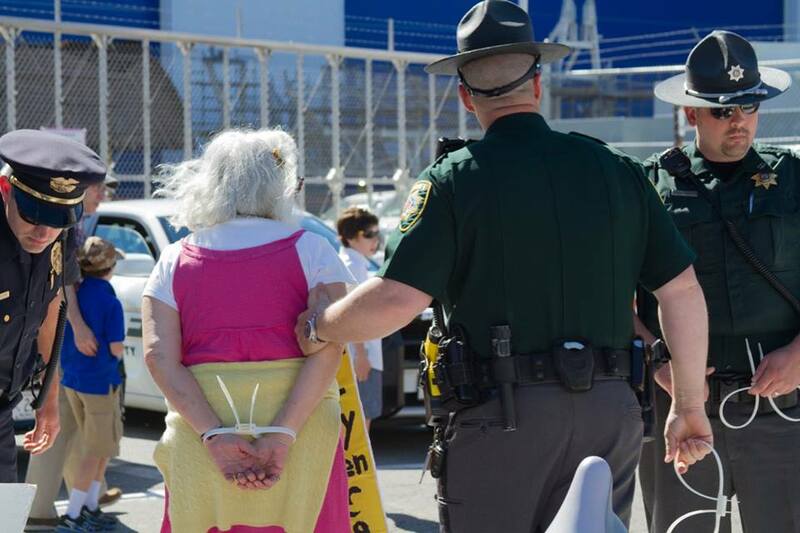 In addition to Gagnon, police arrested Dudley Hendrick, 74, of Deer Isle; Cynthia Howard, 69, of Biddeford; Constance Jenkins, 68, of Orono; Tarak Kuff, 74, of Woodstock, New York; Richard Lethem, 79, of Bath; John Morris, 79, of New Gloucester; George Ostensen, 61, of Hope; Joan Peck, 69, of Brunswick; John Peck, 75, of Brunswick; Jason Rawn, 41, of Lincolnville; and Russell Wray, 61, of Hancock. 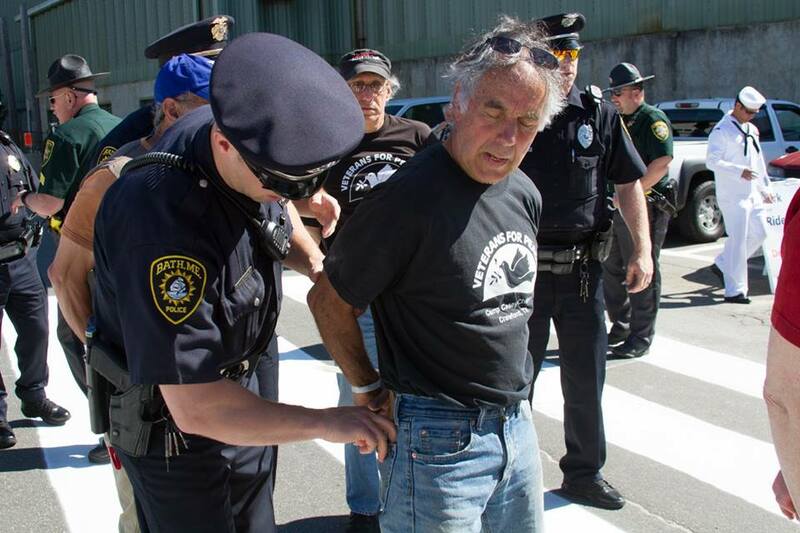 They were charged with Class E misdemeanor obstructing a public way, fingerprinted and are scheduled to appear in West Bath District Court on Aug. 2, according to a release Saturday from the Bath Police Department. 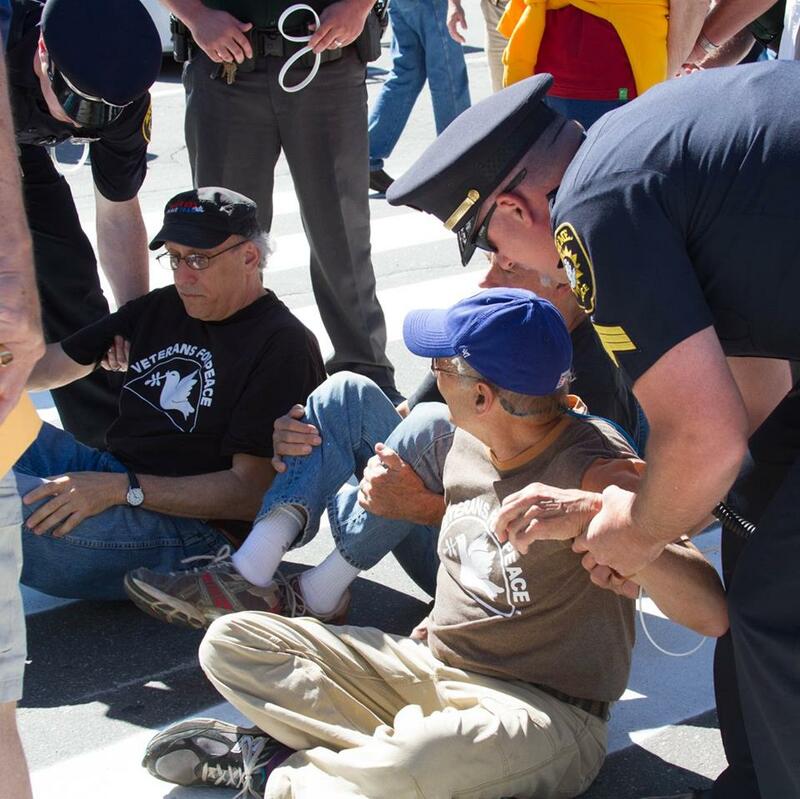 According to the release, the group blocked pedestrian and vehicular traffic in front of BIW’s South Gate, and remained despite a lawful order to leave and despite being told that if they remained, they would be arrested. They were then arrested one at a time by Bath police and deputies from the Sagadahoc County Sheriff’s Office. According to the release, they were cooperative throughout the arrest and booking process. The DDG 1001 was named for Petty Officer 2nd Class Michael Monsoor, a Navy SEAL who was posthumously awarded the Medal of Honor after his death in Iraq in 2006.